Soaring ceiling and breathtaking Beaux Arts architecture, The Grand Central Terminal has seen it all. Opened in 1913, during the cross-country train travel, it received a facelift in its eighth decade.The orante structure turned 100 with great panache having scored a great milestone. 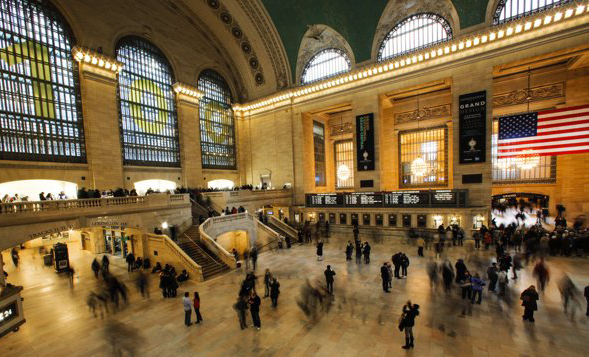 The Grand Central is “the world’s number six most visited tourist attraction” with nearly 21,600,000 visitors annually. Opened on Feb 2, 1913, trains were considered a luxurious means of traveling across America. The architectural gem is still one of America’s busiest transportation hubs. The Grand Central Station has been celebrated in Hollywood films spanning decades. The expanse and antiquity of the structure possesses a quaint quality, making it a dramatic location to film important scenes. Many classic movies have a few scenes set in Grand Central, the landmark building of New York. Here are a couple of films that have incorporated Grand Central Station into the script. North By Northwest: Alfred Hitchcock’s classic film, had the dashing Cary Grant make his escape from New York City, the thrill-a- minute sequence was filmed at night, inside the real station. Midnight Run: The 1988 film has Robert DeNiro drag Charles Grodin (who is scared of flying) through Grand Central, to catch a train to Los Angeles. The Cotton Club: Francis Ford Coppola’s film Cotton Club has the climax scene with Richard Gere and Diane Lane board the train in Grand Central, headed for a new life in L.A. This Jeff Bridges and Robin Williams starrer has one spectacular scene.The Grand Central Terminal was transformed into a glittering ballroom.400 Waltzing commuters danced around the terminal from 8 pm until the next morning. The 1978 Superman features the Grand Central Terminal for scenes with the villain Lex Luthor.The scene was a recreation of the original. Marty the Zebra and his friends—Alex the lion, Melman the giraffe and Gloria the hippopotamus—find themselves at Grand Central Station in the 2005 American computer-animated comedy film, produced by DreamWorks Animation.